This season, I noticed KOVO has become even more lenient with calling iffy balls “in.” I sometimes feel they go too far and call balls that have not touched any part of the line “in.” With regard to challenges, I noticed on rare occasions they get it totally wrong. To me, the rule should be: if you can’t really tell (for sure) even after watching the replays several times, the original call stands. It is wrong to overturn such calls. Watch video clip above. Korean fans seem very split, but I like the current system. I like it because it makes the season more unpredictable (and thus more fun). For example, the men’s season right now (when compared to last season). To me, the availability of money should not dictate too much the overall success of a team. Having said this, I do feel the salary for men and women should be equal. (Right now, men receive more.) A personal question I have is: how open-minded are the head coaches and staff at the tryout. How much do tryout performances actually influence selection… (I ask because some fans feel their assessment of the players can be questionable.) Meanwhile, I read that starting from next season, KOVO is getting rid of both the North America and age eligibility restrictions (right now 26 max) for women non-Korean players. I wish the head coaches would not carp about specific mistakes players have just made. They are all professional players. I’m sure they know what just went wrong. Coaches need not explain everything all the time. Plus, there’s no use crying over spilled milk. If I were a coach, I would spend more time talking about the overall tempo/flow, intensity, tactical adjustments, etc. If the non-Korean player is okay with it, I don’t feel this is a problem in and of itself. It is desirable, however, for teams to have as many Korean players attack because: 1) it will disrupt the blockers, and 2) the non-Korean player will be less fatigued throughout the long, grinding season. In Korea, the non-Korean player is generally the go-to, clutch player who is capable of spiking bad balls too. He/she normally scores 20-40 pts per game. FYI: Above is Nicole Fawcett who played in Korea before tryouts began in 2015-16. (For men, it began with this season.) She is arguably the most beloved female non-Korean volleyball player of all-time in Korea. She played for 도로공사. I think she subsequently played in China, Turkey, and Italy(?). Right now, men’s matches generally take place right after the women’s matches. (On weekends, it’s the opposite.) Not all, but most men and women teams share a court. This means the start time for a latter match is always variable. Recently, there’s been demand for making all matches (men and women) start at 7 p.m. on weekdays. (Women’s matches currently start at 5 p.m.) But KOVO’s main worry is with TV ratings plummeting. It does not want men and women matches fighting each other for viewers. But the problem with having 5 p.m. matches (for women) is that it’s hard for most people to actually go and watch. One solution could be assigning separate days of the week for men and women matches. Another area for improvement is match scheduling. Right now, it’s sometimes too unevenly spaced out. KOVO could do better here as well. Above is a video clip about Korean volleyball in the 80s. Volleyball seems to have been very popular back then. But I also think people just have so many more options now. 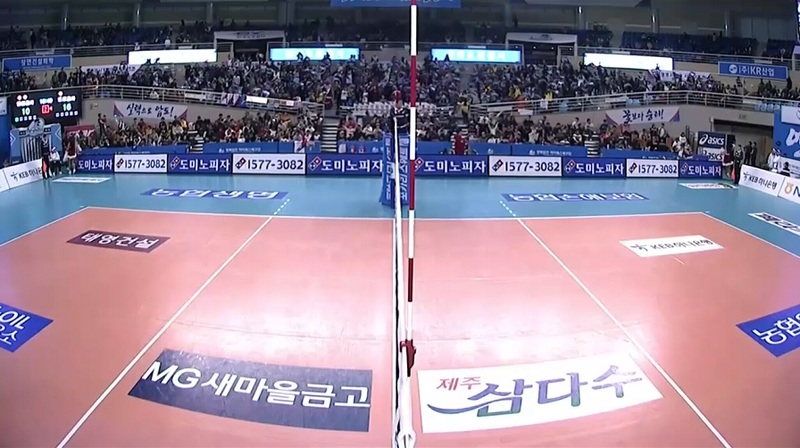 For the latest news on Korean volleyball, click here.